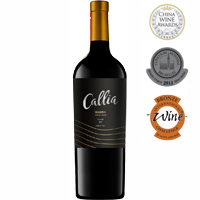 Callia Magna Shiraz är ett mörkrött vin med balanserad kryddig doft med inslag av lakrits, vanilj och kokos. Fyllig sammetslen smak med mjuka runda tanniner och lång eftersmak. Guldmedalj vid Argentina Wine Awards 2007, SYRAH de MONDE 2007, SYRAH de MONDE 2008, SYRAH de MONDE 2010 och invald i gruppen "Världens 10 bästa Syrah-viner" på mässan 2008. The grapes were hand-harvested in the morning, and placed in 18 kg-plastic boxes. Once in the winery, a cluster selection was performed. This selection was followed by a soft de-stemming and selection of berries. From the selection table, the berries passed directly to a 450 kg hopper which carried them to stainless steel tanks, without using pumps. As the berries arrived virtually entire to the fermentation tank, slight carbon maceration took place, which helped to extract the aromas of fresh fruit. After cold maceration for 96 hours at 9°C, select yeasts were inoculated. Fermentation was performed at controlled temperatures of 26°C to 29°C for eight days. Daily and very softly, the cap was manually pumped over and trampled until the end of fermentation. Maceration continued for another 26 days. The wine was subsequently rocked and malolactic fermentation took place. The wine was aged in new American oak barrels for eight months.